I've had a tin of peaches floating around my cupboard for about a year now, probably much longer to be honest. In fact, long enough that the sight of them staring back at me every day has actually begun to annoy me. I hide them at the back behind the beans and emergency soup, but they always manage to make their way back to the front. Today however, I decided that I was going to embrace this solitary tin of peaches, and better still, cover them in caramel and pastry. I had half a pack of puff pastry in the freezer so decided that I was going to try my first ever tarte tatin. When I next make it though (which I'm definitely doing as it's really really good) I will use a bit more pastry (I only had 250g) so that I get a thicker base. Now I don't have a tatin dish so I looked around for a regular cake pan, nope none of those either (I don't really bake that much!) but I did have an enamel plate that had a bit of a shallow base to it, so that was commissioned into service. If you have a tatin dish (they have a nice thick base) then make your caramel in this, if not you will need to make it in a heavy bottomed saucepan then pour it into your improvised dish. Thanks to cheating and using ready made puff pastry the only slightly tricky bit about this is making the caramel. I was busy dancing around the kitchen to PJ Harvey wasn't paying attention and heated it too quickly so it split. I just removed it from the heat and whisked it back together (sometimes this works for caramel, if not just start again). Roll out your pastry into a large circle that will fit over your tatin dish/cake pan/enamel plate so that its about 8mm thick (mine was only about 4mm and it definitely needed to be thicker so you get all those lovely layers of pastry). 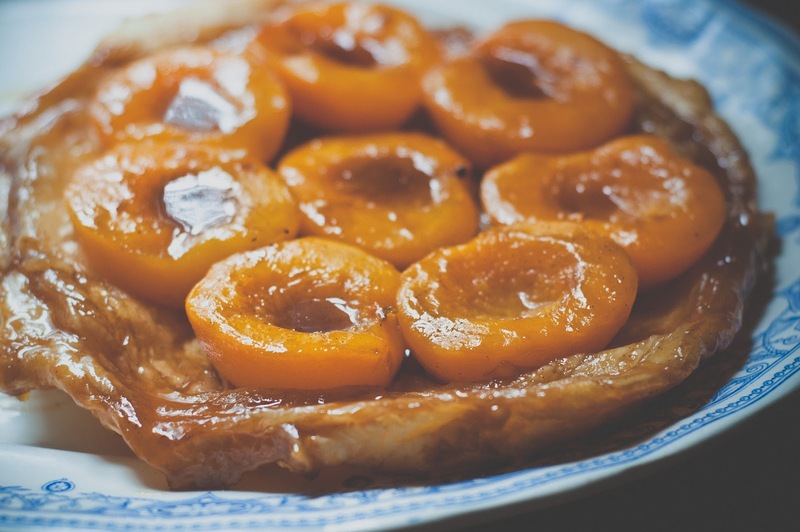 Make your caramel by putting your sugar, butter, vanilla pod and seeds into either your tatin dish or saucepan (if you don't have one) and heat gently, don't stir just swirl the pan to mix. It will start to bubble and slowly turn into a dark caramel colour. At this point pour it into your dish, arrange the peach halves on top and cover with your pastry. Poke a few holes in the pastry to allow the steam to escape so your pastry stays nice and crisp. Seal the pastry around the edge of your dish by squidging any excess pastry before baking in an oven for about 20 minutes or until the pastry is puffed up and golden then take it out of the oven, pop a plate on top and quickly flip it over so that your pastry is on the bottom and behold the glory of tatin. I love cooked peaches. I do this with them, which is sort of the same but you're very clever and added pastry. Everything is better with pastry. I wonder if it would work with that tin of pineapple I have lurking in my cupboard...? I may just have to try it now! Ooo you should try them with masala and dark chocolate chunk in the middle - pop in the oven et voile, amazing yummy dessert no fuss! I made this at the weekend. It was AMAZING. Something funny happened with the sugar/butter caremalising, and I only had vanilla essence, but I shoved it all in the oven and it tasted fantastic. Thanks for the recipe - I'm planning to try it with other fruits now as well (whilst trying not to get a serious sugar addiction). So pleased you liked it Tori. What was the funny thing that happened?